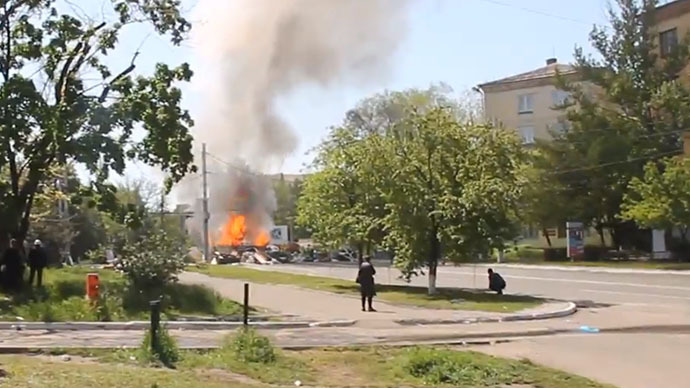 A checkpoint of the self-defense forces in Slavyansk has come under heavy gun and mortar fire, with explosions heard from the city. The attack comes hours before a regional referendum is due to begin. Loud explosions and gunfire could be heard as mortar shelling of the checkpoint near Slavyansk resumed on Saturday night. Self-defence forces expect that after artillery preparation, Kiev’s military and paramilitary units deployed nearby could storm the city, Itar-Tass reports. Earlier on Saturday, according to the city’s self-defense, a checkpoint near Andreevka village, which is close to Slavyansk, came under attack. This is close to an area where voting in the autonomy referendum is due to start Sunday. "They used mortars to shoot at us and fired mine shells," an anti-government activist told RIA Novosti. This is not the first time Andreevka comes under fire. According to the Itar-Tass correspondent reporting from the scene, there was about 10 minutes of unceasing heavy fire coming from the local TV tower, which had earlier been occupied by Kiev forces. Citing reports coming from locals, RT’s Paula Slier tweeted from Slavyansk the Ukrainian troops are allegedly deploying “Grad” missile systems on the outskirts of the city. Self-defense forces have confirmed to RT that an assault took place. “Yes, there is gunfire on the outskirts of the city, apparently heavy weapons. 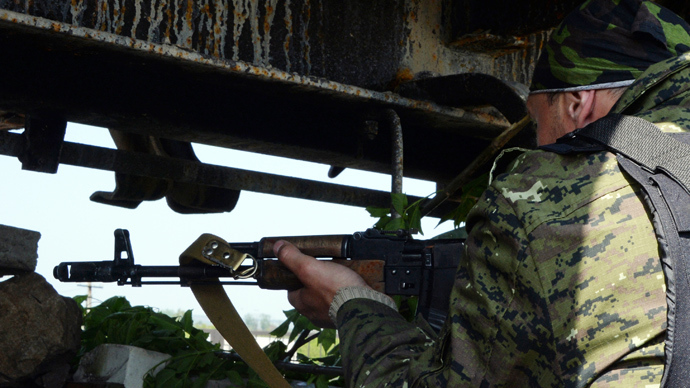 There are casualties on our side,” Slavyansk self-defense spokeswoman, Stella Khorosheva, told RT. Meanwhile, reporters on the ground say at least 8 people got injured. Witnesses in the city downtown report they heard two blasts, but at the moment the scene is calm with them. Earlier in the day, Slavyansk “people’s mayor” Vyacheslav Ponomaryov told the press that at least 20 people were killed and 30 wounded since the start of armed hostilities in the south-eastern Ukrainian city. 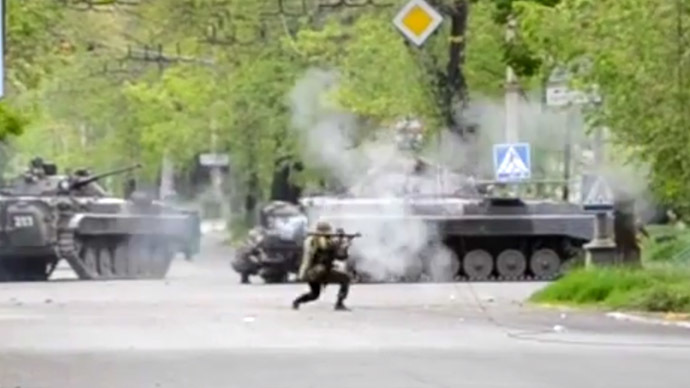 One of the injured is a nine-year-old boy was fired at from an automatic rifle while walking in the street on May 9, during the Victory Day Parade. “Most likely, some [armed] group infiltrated the city. A boy was shot at. 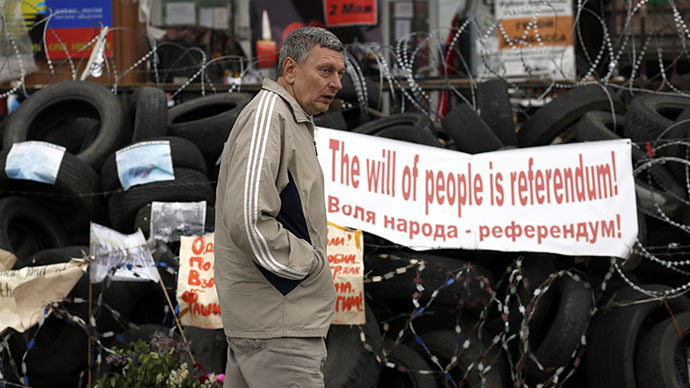 He sustained two gunshot wounds, which passed clear” through his body, Ponomaryov told journalists Saturday. The boy's conditions is serious, but life is out of danger. 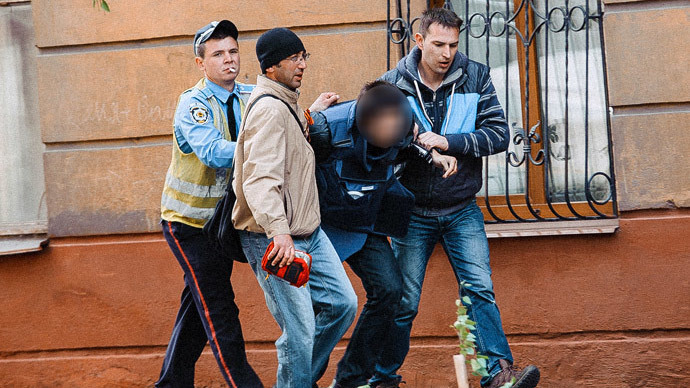 Self-defense forces have captured a few dozen adversaries, including soldiers as well as “enemies disguised as journalists” and covert operatives with explosives and other weapons, Ponomaryov said. He stressed that if Kiev wanted to start a dialogue then the coup-imposed authorities should stop the aggression and withdraw the troops from the region.